Is This The Future Of Blog Commenting? [UPDATE] My bad on this – it appears that for the moment this is a custom mod and not a plug-in. Somehow or other I don’t think it will take too long. A couple of weeks ago I came across this blog and thought the UI was pretty cool. 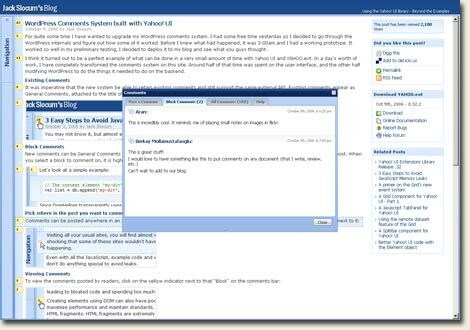 The interface is built on Yahoo User Interface Library, and allows the ‘block commenting’ of posts – you can literally attach your comment to any block of the main post. The code is available for download from Jack’s site and works with WordPress blogs. Very interesting and might just change the way blogs are commented going forward.